"Best Pool Service I ever had. Had Pool service since 1984. Thanks." -Maureen T.
"First time ever using professionals to close pool. Best decision we ever made!! Thank you." -Sheila D.
"Consistant Excellence VIP - Very Important Pool. Thanks." -John F.
"Great service as always. Prompt and friendly." -Kay N.
"Great job, very accessible to answer questions." -Glenn F.
"Exceptional service as usual! Thank you for a great season." -Harvey K.
"Everything is left neat and in order. Pool always looked great! So my over all rating, Great!" -Robert D.
"Once again, Great Job! Thank you for helping us with our new pool cover." -Peter C.
Preparing your pool for use is much more than simply removing the cover. There are several important steps needed to ensure that your pool is safe, healthy and ready for use. Months of ice and snow may cause unexpected damage to equipment, therefore proper component inspection is extremely vital. To get your swimming season started contact us for your customized program. With changing seasons its imperative that your pool closing be performed by a professional to ensure you and your pool are protected against the harsh winter months, in-turn saving you time and money. As a State-licensed certified pool contractor (NJ#13VH06362000), we install the latest cutting-edge equipment needed to keep your pool clean, healthy and beautiful. We represent only the finest manufacturers. Our Qualified Service Technicians diagnose, isolate and repair problems in the most time efficient manner. We also offer in-ground pool liner and safety cover replacement service. We are the premier provider of In-ground Swimming Pool Maintenance for more than 28 years. Our goal is to provide the very best in swimming pool cleaning and water conditioning services. Because our quality control standards are high, our maintenance staff are among the best in the business. Our goal is to always deliver excellent and consistent service to make sure your pool is a Healthy Environment for your family to swim. You can be confident that your swimming pool water will be properly balanced and sanitized when SwimBrite by Checkers maintains your pool. 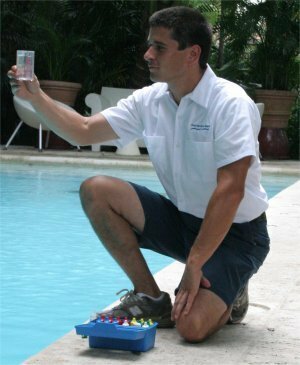 We utilize our unique procedures of swimming pool maintenance along with onsite water testing and balancing using our Exclusive Brand of Professional Grade SwimBrite Pool Products. SwimBrite by Checkers regularly scheduled proper care of your swimming pool water ensures your pool will be Clean and Healthy along with helping to preserve your pool filters, pumps, heaters, structure and other related components which saves you time and money. We want you, our valued customer, to be Happy and Safe.